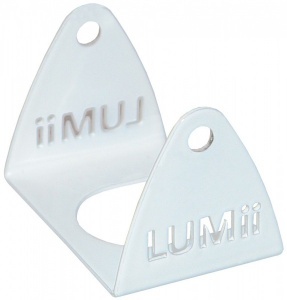 When you want to hang a lamp vertically, the LUMii® Cord Set Hanging Bracket is just what you need! This simple, yet effective hanging bracket allows lamps to hang alone securely; without a reflector! The LUMii® Cord Set Hanging Bracket is very useful for getting extra light into the extremities of your growroom or into thick vegetation. Simply attach to the LUMii® Cord Set, the bracket takes stress off the cable and allows the lamp to hang vertically.